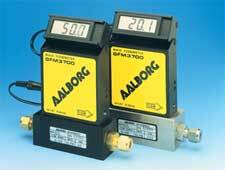 A low cost solution to thermal mass flow metering for gases is presented by Aalborg in introducing the model GFM mass flow meter line. The GFM design combines the convenience and accuracy of conventional mass flow devices with low costs previously unattainable. 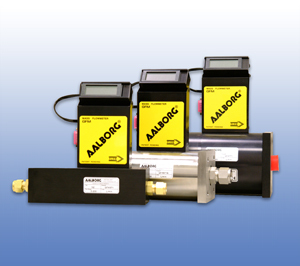 Each of these meters incorporate an advanced straight tube sensor in conjunction with flow passage elements constructed of aluminum and brass for non-corrosive gases or 316 stainless steel for corrosive applications. Compact, self contained GFM mass flow meters are designed to read flow rates of gases. 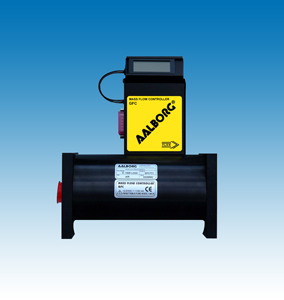 The rugged design coupled with instrumentation grade accuracy provides versatile and economical means of flow control. Aluminum or stainless steel models with readout options of either engineering units (standard) or 0 to 100 percent displays are available. The mechanical layout of the design includes an LCD readout built into the top of the transducer. This readout module is tiltable over 90 degrees to provide optimal reading comfort. It is connected to the transducer by a standard modular plug, and is also readily removable for remote reading installations. Transducers without LCD readout are offered for OEM applications. 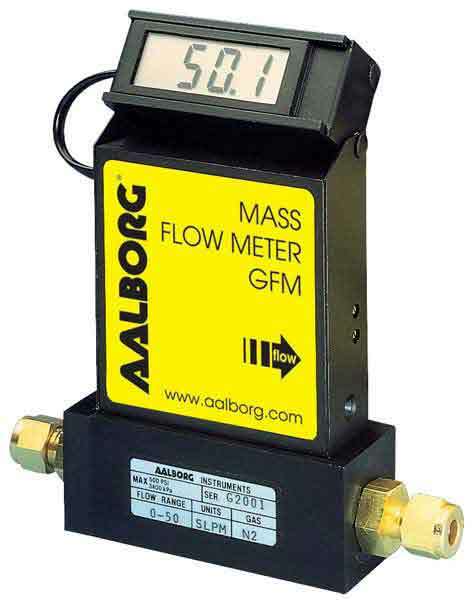 GFM mass flow meters are available with flow ranges from 10 sccm to 1000 sL/min N2. Gases are connected by means of 1/4” 3/8” 1/2” compression fittings and 3/4” FNPT fittings. Optional fittings are available. These controllers may be used as benchtop units or mounted by means of screws in the base.